Looking for Rufous Bristlebirds can have an added attraction - you can get to drive the Great Ocean Road in Victoria, one of Australia's outstanding tourist venues. 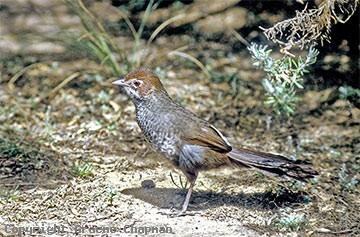 Rufous Bristlebirds range from near Torquay in Victoria to the mouth of the Murray River in South Australia. The range is mainly coastal; in Victoria, dense low heath along the sea cliffs is one of the favoured and most accessible habitats ( pics. 521207 & 521211) - in some places it is only a few hundred metres wide whereas elsewhere as in the Otway Range and near Portland the birds occupy different habitats further inland. Further west in S.A. acacia scrubs on sand dunes become one of the principal habitats. (pic.521205) They do seem to be fairly adaptable. The nesting birds in my pictures had taken up residence in a patch of blackberries on a vacant block in the village of Wye River and there are numerous stories of people having Rufous Bristlebirds in their backyards. At a couple of carparks along the Great Ocean Road they even venture out into the open to look for food scraps. You may try looking at Point Addis or Loch Ard, but only at quiet times, if there are any! All these habitats have one important feature - dense vegetation that is open underneath - this allows them to run (they rarely fly) everywhere in safety. Recent studies have revealed that they are one of our most sedentary species. Adult pairs spend their whole lives in permanent territories of little more than two hectares. Because they are so reluctant to break cover they are very susceptible to fragmentation of their habitat, so much so that a clearing as little as 200 metres wide can be an effective barrier. Coastal development, particularly in such a tourist oriented area will be their main danger. At the eastern end of their range, replanting previously cleared clifftops has met with success and allowed them to reoccupy formerly isolated habitat. 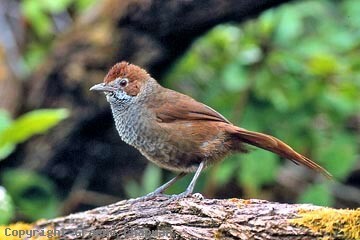 See also Rufous Bristlebird (Western Race). 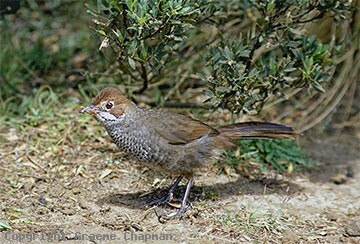 521001 ... Rufous Bristlebird, female with nest material, Wye River, Victoria. 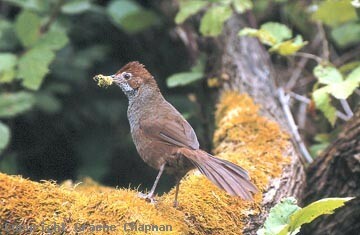 521002 ... Rufous Bristlebird, adult male. 521203 ... Nesting bird near Peterborough Vic.